Mark Weiser wrote in Scientific American article "The Computer for the 21st Century" an insight I've often thought on: "The most profound technologies are those that disappear. They weave themselves into the fabric of everyday life until they are indistinguishable from it." I've been thinking a lot about the legacy of Steve Jobs and his Apple computer after the announcement of his stepping down from his CEO role to become Chairman of the Apple Board of Directors. Apple's products have significantly shaped my life over the past two decades, starting with my first Mac, an SE30 that I bought in 1987. Since then, I've bought over twenty Apple products and over the past two years worked in the app development space. I'm of course very grateful for the way Apple products have inspired me through my educational years, in my career as an inventor and businessman, as well as in my avocation as a composer. What Apple has done in it's app marketplace is a radical reinvention of the shareware model of software development, enabling everyone to pay some small amount instead of only 1-2% as in shareware's previous incarnation. Apple has made it possible for small businesses like mine to pursue their passion for invention, making small projects profitable like never before. Apple has changed my life significantly for the better. That's a big statement. But I'd like to comment on a small life vignette today. When American car manufacturers turned to the Japanese auto industry to understand how to improve their own manufacturing process, they found that it was the attention to incredibly small detail that led to the success of the Japanese manufacture process. Apple has always done that. What always amazed me with Apple products is that new computers would be packed with features their future users wouldn't even know they could ask for, or even want. Speech recognition, games, full movie editing suites, music composition suites. Apple just put them in, knowing that users would become creators if they had the software without the hurdle of having to buy it. That meant Apple computers were more expensive than Windows husks. But their users would find themselves doing more with them. 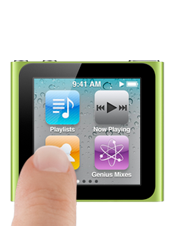 There is one particular detail I just learned about Apple's touch-screen "Nano" iPod recently. Like Mark Weiser's ideal computers, that disappear, the shuffle has a propensity of getting lost quite easily. Ask me, I just washed mine on the warm cycle with my gym clothes. The surprising thing is, on a whim, I plugged it into my clock radio. It immediately was able to play songs from memory! The water of course had drained the battery by shorting the exposed charging contacts. But after a day or so had fully recharged and the screen lit up. What kind of company makes washable electronics products? I'm not surprised it's Apple. Surely Apple doesn't tout that its products are waterproof. They don't tout a lot of features that they include free of charge. But it sure is a delight to find new benefits when you don't expect them. I do not suggest you try to wash your shuffle deliberately. (I'm not planning to ever repeat this experiment.) And if you ever do wash your iPod Nano or iPod Shuffle, and you want to recharge it, it's best to attach it to a USB port or into the charging station of a clock radio rather than a socket charger which could be risky in the case of an actual short circuit if the casing has been compromised. So I must thank Apple again for surprising me with the water-proofedness of my iPod Nano. It's always the small details they pay attention to that make Apple users so cultishly loyal to their brand. As their technology "disappears" into the fabric of your everyday laundry, it helps for it to be wash-and-wear ready.